Financial Accounting Software (Standard Edition) is a comprehensive utility to manage business accounting records in efficient and effective manner. Financial accounting management software is specially designed to maintain bookkeeping of business accounting records in systematic manner. Financial accounting and invoicing management tool provides facility to create new company records, view existing company records (with user authentication facility) and edit or delete company's records as per requirements. Accounting software for small to large business organizations facilitates to provide product sale/purchase information, customer/vendor contact information, tax related information, voucher entry details (for total transactions) and other accounting records for better business management. Data Doctor's financial accounting management software (standard edition) provides facility to generate various accounting reports for evaluating total business performance. User friendly business accounting and inventory management suit is easy to use and does not require any technical expertise to handle it. 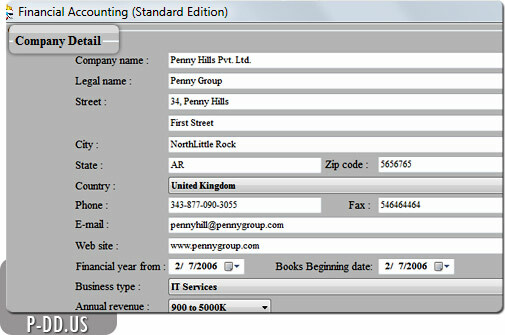 Easy to use accounting software manages invoicing system of the company in real time. Easily maintains voucher entry details, customer records, vendor records, company records, tax related information and much more. Inventory management software provides detail information of sale/purchase order of the products, stock information, payment and receipt voucher details and other bookkeeping accounting records. Professional financial accounting software provides the general information of debit note, credit note, production, unit creation and currency creation details in easy way. Software facilitates with great data connectivity feature that is helpful to fetch the data from other LAN network connected computer machine. Generate various financial accounting reports (such as Balance Sheet, Profit & Loss Report, Cash Book, Bank Book, Sale/Purchase Report and more) to calculate total business transactions. GUI based software utility provides user authentication facility to open an existing account for security purpose.